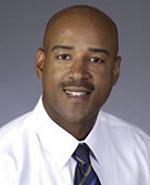 Born in Haiti, earthquake engineering specialist Reginald DesRoches is now associate chair of the Civil and Environmental Engineering Department at Georgia Tech. 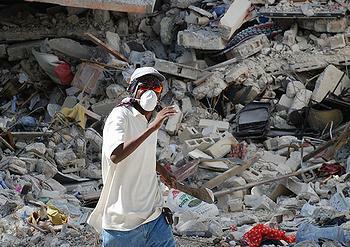 Since the January 12, 2010 earthquake, he has traveled several times to the capital Port-au-Prince to gather samples of typical concrete rubble and sand types used as fine aggregates in making concrete. 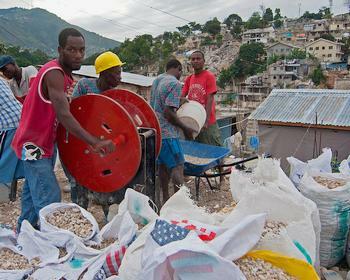 In Port-au-Prince, DesRoches and Georgia Tech researcher Joshua Gresham encountered no mixing trucks and found that local laborers all mixed their concrete by hand in small batches. In Haiti, DesRoches and Gresham manually cast an initial set of standard 3-inch by 6-inch concrete test blocks, using mixes from several different construction sites. They returned to Georgia Tech with their cast blocks, sand samples and notes, where they discovered that the concrete blocks cast in Haiti were of inferior quality. “The Haitian-made concrete had an average compressive strength of 1,300 pounds per square inch,” says Kimberly Kurtis, a Georgia Tech professor and chair of the American Concrete Institute’s Materials Science of Concrete Committee. “In comparison, concrete produced in the U.S. would be expected to have a minimum strength of 3,000 pounds per square inch,” said Kurtis. For a second round of tests, the researchers manually crushed rubble samples with a hammer to provide coarse aggregate, used sands collected in Haiti and mixed the batches by hand. But this time, instead of estimating the amounts of materials they measured volumes using methods prescribed by the American Concrete Institute. This time the blocks showed an average strength of more than 3,000 pounds per square inch. DesRoches said recycling concrete rubble into new building material eliminates two hurdles to reconstruction. DesRoches, Kurtis and Gresham plan to share their research results with Haitian government officials and nongovernmental organizations working on reconstruction projects. Use of recycled concrete aggregate is not unprecedented. It is used worldwide for roadbeds and drainage, and some European countries use up to 20 percent recycled aggregates in structural concrete. DesRoches is hopeful that a debris strategy and infrastructure will emerge once Haiti’s disputed presidential elections are resolved. “Some think that many rebuilding projects have on hold for the past few months because of distraction from the elections,” he said. The next round of elections was supposed to be held on January 16, but Haiti election officials said Wednesday they will not be able to hold a presidential runoff election until late February. They are waiting for a report on preliminary results from the country’s disputed first round in November 2010.